Stand a chance to be the lucky winner of the day and win a Kedai Mesra PETRONAS card worth RM1,000. 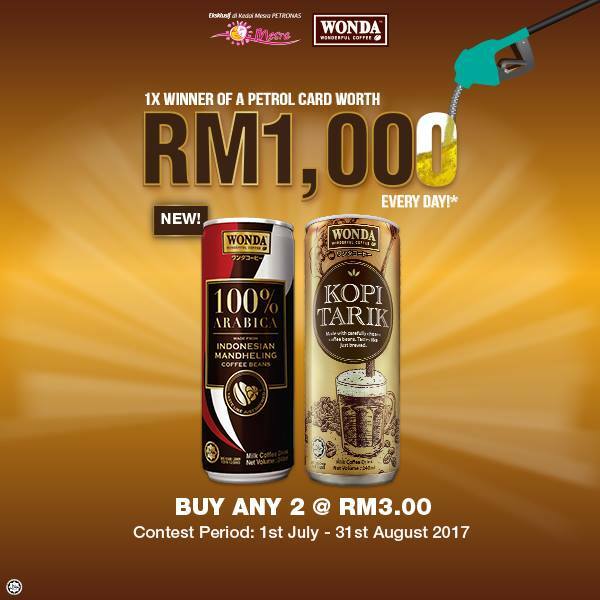 BUY 2 WONDA Coffee at a promo price of RM3 in one (1) receipt from Kedai Mesra PETRONAS between 1 July - 31 August 2017. SMS (MENANG)< space>(last 5 digits of your Kedai Mesra PETRONAS receipt)<space>(Date of receipt DDMMYY)<space>(last 5 digits of Kedai Mesra PETRONAS GST number)<space>(12 digit IC No) )<space>(Product purchased)<space>(Your name)to 36266. Do KEEP your original receipt with details matching the info you have submitted in your SMS as proof of purchase. Copies and reprints of your receipt will not be accepted. *Each receipt entitles you to one (1) SMS submission. To check the list of daily winners, visit http://bit.ly/WCPetronasSMSwinners. Subject to receipt as well as approval of proof of purchase. Terms & conditions apply, http://bit.ly/WCPetronasSMStnc.